Not New York, not Neapolitan — just pizza the way owner Jeff Chin likes it. The interplay between the ingredients made the soppressata pizza one of my favorites. There's something mesmerizing, exciting, and simultaneously soothing about watching pizza being tossed by hand. It's a spectacle that customers are treated to upon visiting Spinning Dough, a charmingly decorated, open-kitchen pizzeria that opened in West Oakland in February 2017. Every pizza is based on this hand-tossed crust, made using dough that owner Jeff Chin creates from scratch. Chin's first brush with the pizza business was when he was in college in San Francisco, where he was born and raised. He started working for extra cash as a pizza delivery driver. Then the owner of the pizzeria asked if he wanted to learn to make pizza, too. But Chin spent the majority of his career — 15 years — working in health care reimbursement. That changed when the Bay Area branch of the company he was working for closed. "So, I was like, 'Hey, let's open a restaurant,'" he said. 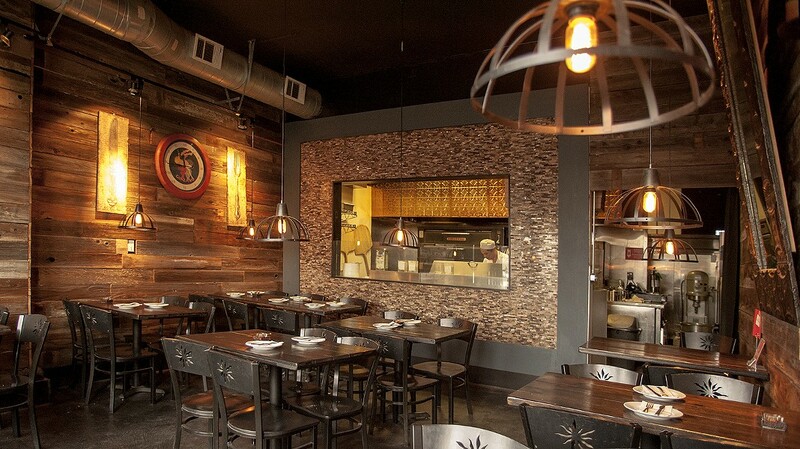 At Spinning Dough, the dough and sauces are all made from scratch. "The most important thing for me for pizza is the dough and the sauce," Chin said. He developed the recipes for his homemade dough and tomato, pesto, and béchamel sauces through trial and error. For the dough, he said, "I went through probably 10 or 15 different types of flour before I found the one that I liked." Thankfully, Chin's hard work developing his dough recipe has paid off. Chin refuses to affix a particular label to his pizza; it's not quite New York style, and it's not Neapolitan, either. The crust is cooked in a gas oven to an even, light golden color. It's thin enough to maintain a satisfying crisp from the center of the pizza to the outer crust, yet sturdy enough that you can pick up a slice without all the toppings sliding off. And the edges of the crust are given special treatment, brushed with garlic oil for extra crunch and flavor. Even as I filled up on pizza, I never felt tempted to leave the crusts behind. I initially thought the crust could have used more salt, but it turned out to be a good foil for the toppings, particularly on the soppressata pizza. I was intrigued by the unique combination of soppressata with honey, green onions, and shredded mozzarella. The pizza was generously topped with slices of salty, rich soppressata (Italian dry salami). There was just enough honey to create a delicate sweet-savory balance, while the green onions added sharp, fresh flavor. The tomato sauce had tiny chunks of tomatoes and provided a hint of acidity. A saltier crust might have thrown off the whole balance. But the interplay between the ingredients made this pizza one of my favorites, and it's one of Chin's favorites, too. Another successful combination was the sausage and mushroom pizza — Chin's current favorite pizza on the menu. He makes the sausage himself every day. It's got a generous amount of fennel seeds, and it's not overly greasy or salty. The red onion was finely diced, which allowed it to caramelize in the oven. The shiitake mushrooms packed plenty of umami flavor, and the tomato sauce helped tie the flavors together. I also sampled the prosciutto pizza. Here, béchamel served as the base for slices of prosciutto, generous handfuls of arugula, and a sprinkling of Parmesan cheese. I enjoyed the richness of the béchamel and prosciutto combined with the bitter taste of arugula, and the crust helped to balance the saltiness of the prosciutto and Parmesan. However, I would have preferred fresh Parmesan shavings, rather than pre-shredded sticks. Most intriguing of all was the seafood pizza: a béchamel sauce base topped with clams, crab, scallops, shrimp, and green onions. Although it's the most expensive pizza on the menu, clocking in at $34, it came with a generous portion of seafood. The pizza is drizzled with garlic oil, along with a lemon served on the side to squeeze on top. The flavor reminded me — in a good way — of a creamy seafood pasta; however, the béchamel was a bit heavy and made the crust slightly soggy. Vegetarians will also find plenty of options at Spinning Dough. My favorite was the corn pizza, made with fresh corn that Chin roasts before adding it to the pizza. This pizza was built on a bright green, exceptionally basil-filled pesto sauce that complemented the sweetness of the corn and roasted bell peppers, while chunks of soft goat cheese added salty, acidic punch. A close second was the margherita pizza, topped with fresh mozzarella that lent a creamy richness to the whole pizza. I also tried the three mushroom pizza, topped with cremini, portobello, and shiitake mushrooms, but the flavors fell flat in comparison to the other options. Chin said a vegan pizza is also in the works; he's developing his own vegan cheese recipe. On weekdays during lunch, solo diners can order a 10-inch pizza, but I do wish individual-sized pizzas were available during dinner. The dinner pizzas, which start at $26, measure 18 inches. For me, it was enough for two hungry diners with leftovers, which is fairly priced if you're sharing, but solo dining is an expensive proposition during dinnertime. There's also a $4 upcharge to do half-and-half on pizzas during dinner, which makes it difficult to try more than one variety unless you're with a large group. Chin designed and remodeled the dining room himself. 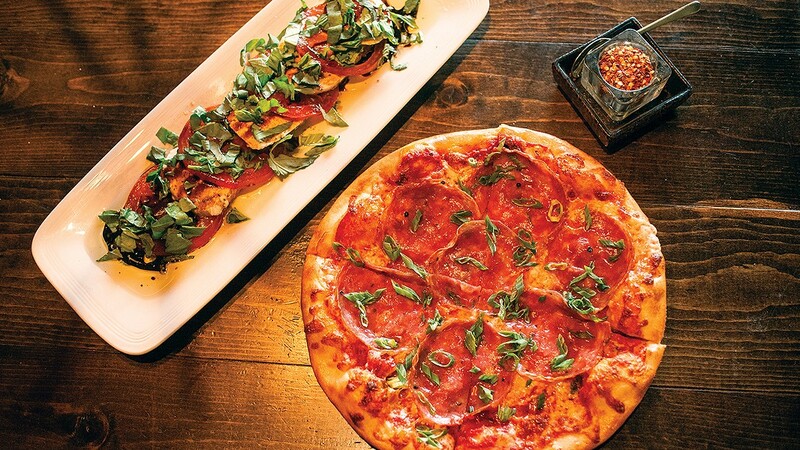 While pizzas are the main draw at Spinning Dough, the rest of the menu deserves recognition. I enjoyed the maple garlic chili wings, which were baked rather than fried. The wings were juicy and the skin developed a beautiful char. The accompanying house made yogurt, mint, and serrano chili sauce was creamy and tangy. And the house salad, topped with warm goat cheese for an extra charge, was an unexpected standout. Mixed greens came topped with dried figs, pine nuts, apple slices, cucumbers, and hand-shredded carrots. The goat cheese was freshly fried, and the crust was thin and delicate. Hours: Mon. 5 p.m.-9 p.m., Tues, Thurs, and Sun. 11:30 a.m.-9 p.m., Fri. and Sat. 11:30 a.m.-10 p.m.